Ok, so I decided not to start my mismatched set of socks like I had talked about in this post. 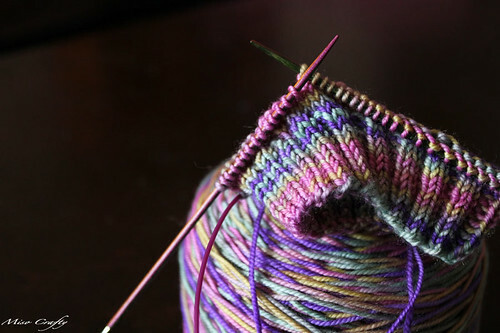 Instead I decided to cast on the Jaywalker socks since they've been in my queue since the beginning of Ravelry. Since before I was even a sock knitter. I figured if I didn't get these knitted up now, who knows when I will. And what better time to check them off my list than during the 12 in 2011? Unfortunately the yarn I'm using is not from stash, but it still counts towards the goal since I had traded away a skein of stash yarn in order to get it from one of the swap groups that I belong to on Ravelry. The yarn is Blue Moon Fiber Arts Socks That Rock Lightweight in the Queen Rock colourway. While I think the colours are gorgeous, I'm still a little undecided about it. I just don't think the colours are me. I think they just might be a tad bit too pastel-y for my liking. And they totally remind me of Easter. Don't you think? So why am I still knitting with it? Well, as funny and weird as this may sound, I've got quite a few skeins of STR in my stash but have never actually knit with it. There's actually quite a lot of yarn out there that I covet but have either never knit with or touched in person. Weird, huh? So I wanted to see what all the fuss was about and if I truly do like knitting with it...which I better since I'm a first time member of the BMFA Rockin' Sock Club this year! So the verdict? I love it. I absolutely do. I like my sock yarn to have some heft to it and this yarn definitely has some. I've heard of the term "well rounded yarn" but never really understood exactly what that meant. Until now. STR is surprisingly round and that's supposedly the reason why it gives such great stitch definition. And really, the stitch definition is amazing and for a yarn that is so insanely tightly plied, it's also quite boing-y. I'm definitely liking the yarn and can already foresee a future with a lot of socks knit in STR. As for the pattern...well...It's über easy and something that you can memorize after knitting a few rounds. I could classify it as a mindless knit and yet it has enough detail for it to not be a boring knit. It's definitely a pattern that you can knit whilst having a coffee with a friend. The start on these though, is a completely different story. I've heard and read that this pattern has no give due to the nature of the stitch pattern and so gauge is quite important for this. Well I had issues with my gauge swatch. It got to the point where I gave up and decided to just start knitting with the recommended needle size. Only I didn't bring along the recommended size to Friday's knit night. I had knit the cuff on 2.5mm needles and realized that it was going to be huge. Then again, I was also knitting the small size. So I ripped and cast on for the extra small. Yeah, still a tad big. I ripped once more, went home, got the recommended needle size and cast on for the small. Again, too big. RRrriiiipppp!!! Ok, 2.25mm needles using the extra small stitch count. So far, so good. If these end up not fitting me, I'm going to hurl the socks out my living room window. I love the Easter colors! I picked up some awesome Orange STR Mediumweight in Portland and cannot wait to knit it up. This is my first skein too! I saw that!!! Let me know how the mediumweight is. I have a skein of heavyweight too that Michelle had picked up for me when she was in Portland last, but I have no idea what to do with it. But I'm dying to knit it up!